Click on the "Settings" icon at the bottom of the DASHBOARD. 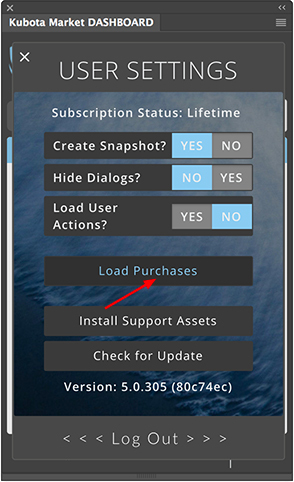 Select "Load Purchases" and allow it to load. All Kubota Market products are run exclusively through the DASHBOARD. However, if you do not wish to subscribe, any purchased Kubota products can be loaded into the Actions palette in any Photoshop version. Simply contact Customer Support to request a link.